The latest evolution of VB in Visual Studio will bring with it a bundle of C# functionality, nudging the two languages even closer together. To ensure we're ready to make the most of these enhancements, Hima Vejella takes us through each new feature. The constant debate between C# and VB developers over which language might be the best is a tough one to resolve, as both of the languages have their own strengths and, when you get down to it, are equally competent. Thus far, the feature split has been an issue in both directions. For example, C# 3.0’s collection initializers feature, which enable it to define the contents of a collection at the same time as declaring it, is not supported in Visual Basic 9.The same is true of auto-implemented properties, which specify property procedures without needing to specify get or set. As a quick example going the other way, Visual Basic supports optional parameters (which can be omitted based on requirement) in methods, whereas C# 3.0 does not. However, both sides should be interested to hear that Microsoft is now trying to have all the features and strengths common to both the languages. As a quick example, C# 4.0 now supports optional parameters (as described above) as well as named parameters ( which are declared with default values), but that’s just scratching the surface. The recent merging of the Visual Basic and C# teams will hopefully help to ensure that both languages grow and evolve together, and Visual Basic has already been updated to include a number of C# features that it was sorely missing. In this article, I’ll give you an overview of all the features, which have been added as part of VB 2010 and .NET4 in the Visual Studio 2010 IDE, and give some quick demonstrations of how they’ll save developers time, and allows us to be more productive at the same time as writing more elegant code. After the assignment operator (“=”), which you can find a more detailed explanation of on MSDN. Figure 1. Implicit line continuation won’t save you from all your compiler errors. As the underscore has not been removed from every single place in VB, this is a language feature which should actually be considered as an IDE enhancement. In any case, the moment we press enter, the control is now aligned to the end of the parameter, which is much more user-friendly. We can see that not only are three properties implemented in just 3 lines of code, but the code maintainability and overhead of declaring and implementing property procedures has now become significantly easier. Public Property EmployeeID As Integer = "1234"
Also based on the feedback from Visual Basic developers, this feature has been made available in Visual Studio 2010 to save time and improve productivity, so the previously laborious property implementations can now be replaced with simple, one-line declarations. As you can see, we can simply create a collection of List (Employee), and each value which is supplied in the collection initializer is passed to the corresponding Add method of the collection. This functionality is not just limited to lists, but could also be used to create something like a dictionary (just as an example). Jason Olson gives some great examples of what this new functionality can achieve in his“10-4” episode on Channel 9. Now the question is, what will the compiler infer if the data types are mixed? In the above example, the compiler infers the datatype as double, and does so by examining each array element datatype and using the dominant datatype to make its inference. Consider the below example; what if string and number datatypes are mixed equally? Unsurprisingly, if we mix these datatypes, the compiler cannot make any specific inferences without the risk of potentially loosing the data due to narrow type conversion of string to integer or vice versa. Figure 2. The compiler is able to handle arrays containing mixed datatypes by inferring them to be Objects. Hence the entire array is treated as an Object, although it’s still recommended to use types in isolation with respect to a individual arrays. Also, in the example in figure 2, the compiler will generate a warning if OPTION STRICT is ON, and will only attempt to infer the type of objects if OPTION STRICT is OFF. We can now pass values from the current scope to a Lambda expression, which is a single or multi line anonymous function inside another function, used wherever a delegate is valid. A multiline lambda function is simply a lambda expression representing a function containing one or more statements. These provide developers with an elegant way of expressing logic locally, rather than splitting it out across several methods. The compiler will infer the parameters and return types where possible, just like in regular lambdas. Moreover, whenever we refer to the declared lambda expression variable, the lambda expression is invoked, and the “Function” keyword is responsible for creating a multiline lambda that returns a value. 'display the Employeesal by iterating the lambda expression. If you’re wondering how you might put this new functionality to use, say we have an array of employee salaries and we want to print all salaries greater than 40,000.Multiline lambda expression is used here to pass into the EmployeeSal. Bear in mind that Lambda expressions cannot have modifiers, Overloads, Overrides, generic parameters, optional or paramarray parameters. In addition, the data type of a lambda expression parameter can either be inferred or be specified using the As keyword, but we have to either specify all the parameter data types, or they all need to be inferred. There are now additional Code snippets in VB.NET which significantly speed up development when working with ASP.Net MVC2, LINQ, Designer Patterns, Error Handling, Office Dev, WPF etc. Simply right-click in the code behind file, select Insert Snippet, and then select the snippet that is required. Code snippets can be created by developers and then easily re-used across multiple projects. Alessandro English has created an addin for VS2010 to add XAML code snippets into the Visual Studio 2010 code editor for XAML, when working in WPF and Silverlight projects. There is also a snippet editor available on Codeplex, which can be used for creating and managing code snippets in Visual Studio. In this simple example, the following bit of code (as seen in figure 6. ), placed the code inside the Main () routine, will output two strings in parallel on the console. Figure 6. Employing the new parallel development functionality to reverse the writing order. Parallel programming can be debugged and examined clearly with the help of this new VS2010 feature, using the Parallel Tasks and Parallel Stacks windows. If necessary, we can navigate between instances with CTRL+SHIFT+DOWN ARROW or CTRL+SHIFT+UP ARROW. The ability to do parallel development will undoubtedly help us to write elegant, and scalable code without having to work directly with threads or locks. While working with VSTO, using .NET to code an application against the Microsoft Office, or working with any application that performs COM Interop, Object Model Primary Interop Assemblies (PIAs)need to be deployed to end-user machines to allow data to move between COM and .NET. Unfortunately, these assemblies are an additional deployment concern, can cause versioning problems, and are also very large, and so deploying them is often a similarly large headache. Thankfully, Visual Basic 10 now allows these applications to be deployed without requiring PIAs to exist on the end user’s machine. This is done by generating local types to be responsible for performing the interop calls to the COM library. Even better, these types are inferred by the compiler, so that the Common Language Runtime (CLR) can identify them across assemblies, and only the PIA types which are absolutely necessary will be copied into the assemblies. 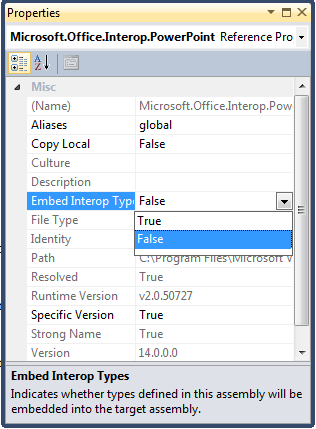 This can be achieved for existing projects by setting the Embed Interop Types property to true in the project’s Solution Explorer reference, although this property is set to True by default for new references. Simply open Solution Explorer, select the PIA reference in the project, Right-click on the reference and select properties of the reference , and then set Embed Interop Types to True in the window which will appear. A limitation in earlier versions of VB was that optional parameters could not be nullable. Visual Basic 2010 now has the ability to define optional parameters of any value type, so now you can create method with optional parameters and also make them Nullable. In this case, strName is an optional parameter that is passed with a default value, intSalary is of type Nullable(Of Integer) and intAge is a non-intrinsic type, but they can still be used as optional parameters. All the optional or default parameters need to be declared at the end of the parameter list, and we can, if we desire, have all the parameters of a method as optional, depending on the requirements we have in mind. Even though the List implements IEnumerable and a Potato inherits from the Vegetable class, this will not work in Visual Studio 2008, but is now supported in Visual Basic 10 and also in C#4.0. Now we can declare covariant widening and narrowing generic types using the Out and In modifiers. This is because IEnumerable interface in the CLR 4.0 has been changed to designate a covariant generic type, and if you’d like to gain a more elaborate understanding of these concepts, then take a look at this article on Generic Co- and Contravariance. With features available in C# and VB starting to converge, both languages will now start to evolve in concert, making a wider palette of options available to developers. Thankfully, you don’t have to only be targeting the .NET Framework 4 to be able to employ these latest Visual Basic enhancements, as they can be used in projects that target .NET Framework versions as far back as 2.0. There is, however, one exception to this backwards compatibility: the Embed Interop Types, which unfortunately has a dependency on types which are only available in the .NET Framework 4. That is, I feel, a small price to pay. If you want to enable this multi-targetting, you can do so by navigating to the Advanced Compile Options (double-click on the Project and look under the Compile tab), and selecting your targets from the combinations at the bottom of the window as shown below. If you’d like to learn more about any of these new features and enhancements, there’s a detailed write-up of what’s new in Visual Basic 2010, by Jonathan Aneja, available on MSDN. It’s also good to know that the feature swap is also going in the other direction, such as the support which has been added in C#4.0 for optional and named parameters, two features that are a part of VB 9.0. Now that we’ve seen what’s new in VB 2010, in my next article I will be rounding off the story by discussing the C# 4.0 enhancements added in VS2010. Excellent article, Hima that demonstrates all VB language enhancements in VS2010 in simple words. Multiline lambadas is the one which we have asked and implicit line continuation is the one which we are requesting from long. I just sent the link to all of my team members.Thanks for sharing the link. Now it is very hard to participate in a debate for which is best VB or C#. i just wanted to know any articles which you have written in asp.net features.too. Nicely written article and very much useful. Thanks. I am working on ASP.NET4 features article. Watch this space and site to get it soon. Good one. It’s nice to know the VB 10 features at a glance including the references. Till now I am unaware of compile tab in VB. This is the best article that I have read on VB langauge features. So simple and easily understandable even the complex feature like Generic variance. Looking farword for the C# article too. Thanks for the great article. And using this i was able to learn all new features of vb.net so simply. This show the quality of author and understanding of the subject matter. We need more article like the same. New features are really cool. Enjoyed reading the article. Indeed, the explanation is clean and easily understandable. This Explanation show the Zeal to lean new Features and Share Konwlede to others. We need more articles like the same. As the subject says this article is excellent. What I do not get is why VB.Net is the red headed stepchild of large company consulting jobs. I can write in C#, but it is such an obtuse presentation. Code in VB.Net is always easy to read and follow, and as an added benefit does not make me feel like I am contributing to a Klingon or Goa’uld knowledge base. I have 30 years of experience and I just do not get it. Back to your article. It is noteworthy and I look forward to your ASP.Net 4.0 article.